The theatre opens 45 minutes before the curtain rises. Available from Wednesday 13 June, 2001 at 10:00 am. After the post-modern: Dance Collaborations in new American style. The avant-garde, abolishing story-telling elements and pursuing physical movements, did hit American dance scene in the 1960s. Dance Planet No.9 focuses on a sequel to post-modern dance, featuring the leading contemporary dancers from Japan and the United States, respectively: Junko Kikuchi and Molissa Fenley. 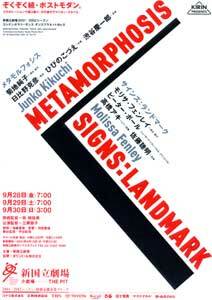 Both Kikuchi and Fenley had their creative bases in the United States of 1980s, and they have been practicing innovative works. In this production, Kikuchi and Fenley collaborate with some artists from different forms, maximizing their creativity. Junko Kikuchi has a reputation for flexibility of physical expressions. Her new work expresses in omnibus style how human imagination changes, as its theme, "The Chain of Human Imagination". Katsuhiko Hibino (Scenery) and Kozue Hibino (Costume Design) will make dancers more attractive with their innovative work. The dance style of Molissa Fenley is alive with a sense of speed. She performs a solo part with Aki Takahashi's piano play, written by Toshiaki Sato, and she also dances with Peter Boal, principal of the New York City Ballet. Dancers perform, as if flowing and floating bodies reach up to the landmark. These new works demonstrate the richness and meaningfulness of body languages beyond generations and borders.